The vastness of the Andes is one of South America’s most iconic and enduring panoramas. Photographing the Altiplano, I was drawn to it as a place where myth, memory and history collide. It was here that in 1818, San Martin set out to liberate the southern cone from Royalist rule, pitting his troops not only against colonial armies, but also against the sheer scale of the mountain itself. Franz Van Riel ‘s two metre oil painting ‘Paso de los Andes’ (1948) draws on this history, while his moutainscapes stretch out into white snowy peaks overwhelming the figures depicted. 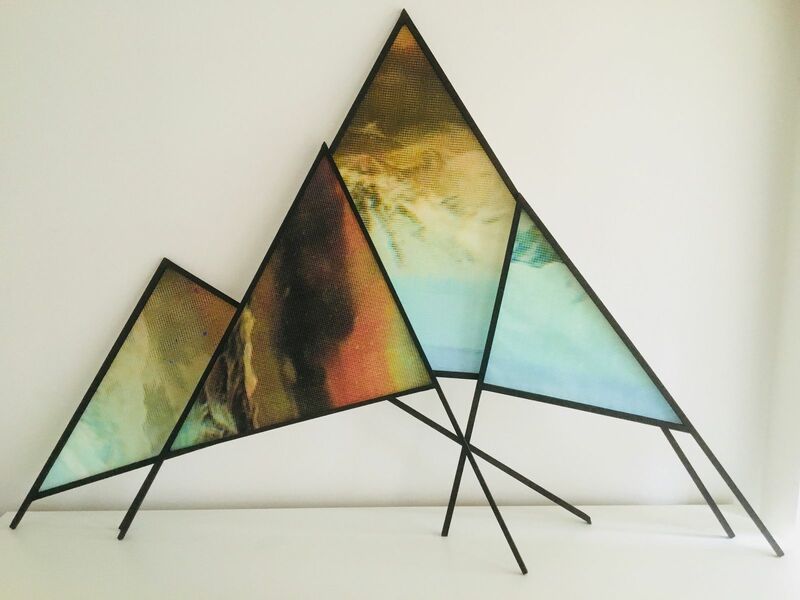 In my installation I create multiple views of the Andes as fragmented scenes that recall a sublime encounter with the immeasurable, and in so doing, create a dialogue through time with the past. Made up of printed film stills that abstract and pixelate the surface, and wooden supports that frame the view, they look to question the colonial gaze, the tourist encounter and our constant need to ‘take in the view’ from a single perspective. 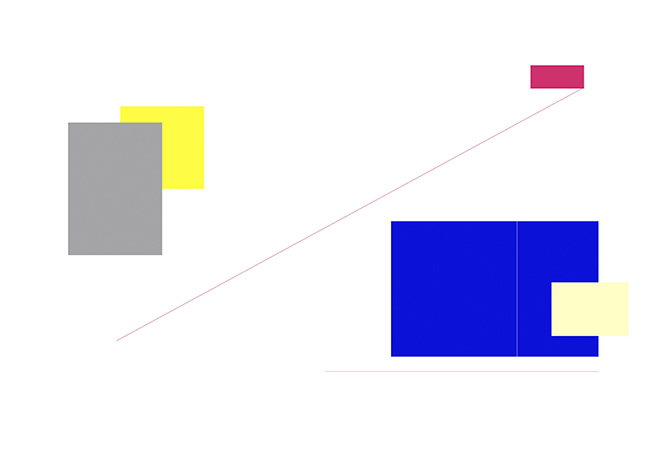 In this way I look to give them more human proportions, providing a multitude of possible encounters with the Andes in the space of the gallery. Working with Joanna Brinton to put theshow together at Good Studios in the BusseyBuilding in Peckham. Also offering print workshops, as part of Peckham Festival alongside Peckham 24 Photography shows. Two person show in the circular gallery under the Observatory in Santander. Encounters of print in space between Altea Grau Vidal and Victoria Ahrens, as part of Impact 10, University of Cantabria, UWE and local partners. An international Print project that reflects on new systems of production, diffusion and commercialization of book art editions. Tierras Aridas takes the landscape as its concept, juxtaposing land with that of deserted spaces, abandoned or marginal spaces that conform to a dystopian imaginary. These spaces offer distances that are impossible to bridge or in the case of Mexico and the United States, opens up a different interpretation depending on which side of the border the artist inhabits. The project proposal adopts, as a methodological model, assembled and collective publications designed to facilitate a collaboration by artists who live in different cities or countries. This project aims to promote the exchange of information and introduce us to different printmaking studios, associations, Schools of Art and Universities in Spain, Mexico (Oaxaca) the US (Phoenix, Arizona) and the UK (London). Wonderer aims to establish connections between the U.K and Greece and considers how different cultural, philosophical and historical interpretations of our solar system can be re-imagined from a contemporary art platform. Wonderer will also house 30 works that were successful in our Stars open call. These works, each of stars, have been selected by Fronteer and, as well as being beautiful pieces of work in their own right, will also help establish a cohesive and immersive exhibition. Wonderer will be held at Athens School of Fine Arts from 17th – 20th May. The exhibition will form part of Platforms Project 18 – a renowned independent art fair that takes place yearly in Athens. 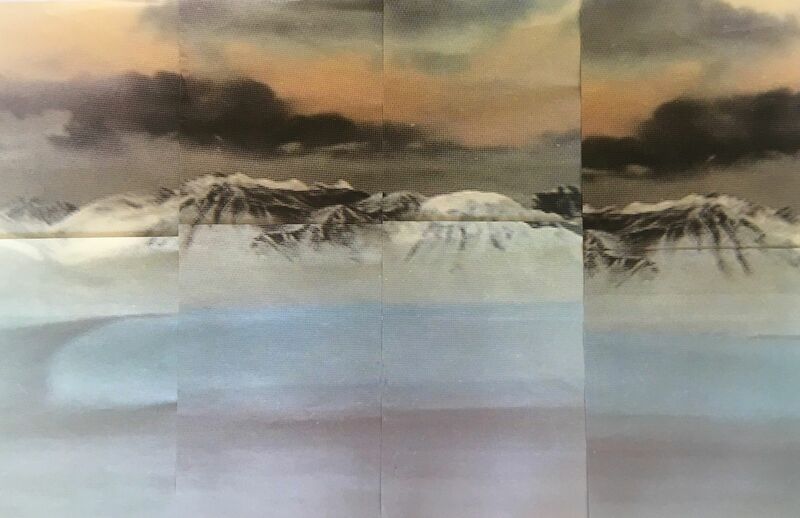 This piece, Allá, is a press transferred photographic print of a double exposure on Japanese paper that explores the nature of landscapes as an artificial construct. It forms part of Victoria’s continued research into the experience of place as a fictional and narrative encounter. Using historic and contemporary alternative photographic processes she looks to hand made surfaces to explore and observe latent and haptic traces of the world around us. Notions of instability and uncertainty are translated into photographic pieces as an allegory for the passage of time and the failings of memory.’ from the catalogue at the Alison Richard Building exhibition, Artificial Things, curated by Shutter Hub. Open from the 3rd of November to the 19th of January. Lightness of Being is a photo etching created from combining an analogue silver print positive with a digital photograph, which was then exposed and developed onto a metal plate in the landscape itself. Working in situ meant allowing entropic traces to become imbued on the surface of the plate, to mark my encounter with the disappearing landscape. The ephemeral beauty of the place belies its traumatic history as a place of political disappearances. In using both historic and contemporary processes I am looking to depict a new imagined landscape that creates a dialogue through time. Part of the Analogue Festival London, exploring how analogue photographic, film and sound-based processes interact with digital technologies, curated by Melanie King and Diego Valente of the Alternative Photography Collective London. In addition this print was exhibited at the RA Summer Show 2017. As an invited artist this year I was selected by Rebecca Salter to participate in the RA Summer Show. This piece was hanging in Room V of the Royal Academy. They were available in an edition of 25 each, 60 cm x 45 cm. From September 1-16, Photofusion will be co-hosting the third annual Burning With Pleasure. Curated by Archipelago, this is an exhibition dedicated to artists’ books. It will take place simultaneously at Photofusion and Seen Fifteen. Here at Photofusion, we will be looking at the different stages and steps artists take when developing their book projects. We will be exhibiting test prints and book dummies by Raymond Meeks, Highchair Editions, Rick Pushinsky, Lewis Bush and Artists Books Cooperative. Included in the exhibition will be a small number of our members’ dummies, self-published and handmade photobooks. As a part of the programme, we will be hosting a book-making workshop with Artists Books Cooperative, a young persons’ bookmaking workshop led by Sayako Sugawara (ages 8-13), and an ‘In Conversation’ on book production and distribution with Magali Avezou, Christiane Monarchi and Lewis Bush. Also as a part of this programme, Magali will be available to review artists books, finished or in progress. These 40 minute advice sessions will be offered to Photofusion members for £25 (£30 for non-members). For the sixteen days of this programme, the gallery will function as a reading room, so please come in, put your things down, don the white gloves, and explore the possibilities of this medium. Selected from the RA Summer Show by Norman Ackroyd who has invited me to participate in this show at the Zillah Bell Gallery in Thirsk, Yorkshire from the 9 September to the 14th October 2017. Climate change denial is on the rise and with Donald Trump’s administration made up of a group of people who are ALL sceptical of the science behind global warming, and his withdrawal from the Paris Climate Deal, we need to push the message of the anthropocene in a post-truth world. London air pollution at highest levels since records began. This research is centred on the notion of landscape as a construct of marginal and multiple dialogues. It is a project that originates from a rediscovered family album of (fading and yellowing) photographs of the Latin American landscape at the turn of the 20th century. In particular a set of photographs that centre on the Paraná River in Argentina, a place where myth, recent history in the form of narratives of the Desaparecidos (those ‘disappeared’ by the military junta 1976-1983) and memory collide. An early analogue photograph of the river has sparked a series of creative interventions that explore the interstices between photography and printmaking, fragmenting the initial image in order to create new hybrid photographic prints using photo-etching and photo-transfer processes, projections. The return of the material to the flat surface of the digital is of critical concern, as the ‘uncanny’ surface is turned into a haptic object more in keeping with printmaking practices and early pictorial photographs. This leads to questions about the pictorial outcomes of these experiments, their affective resonance and the enactment of the hand-made, where touch and ‘noise’ return to the surface of the print as a resistance and response to discourses of acceleration and reproduction, remembering and forgetting. The theoretical and practical methodology is cyclical, and the multiplicity of layers of discourse appears both in the printed multiple and in the multiple voices I use to discuss the project in writing. The research is timely, as digital practices and the internet continue to accelerate the dissemination of the networked image, and speed up our relationship to photographs and prints, I aim to slow them down, in order to discover what is lost or gained in the process, both in practical and theoretical terms. In the ruin of the analogue photographs I use, therefore, a new ruination and expansion of the surface occurs as I develop my photographic plates at the site of the river Paraná itself. In the encounter with the landscape, the forensic traces of Argentina’s political disappeared (now part of an ongoing forensic anthropological investigation at sites along the Paraná) create latent marks on their surface and these invisible fragments serve to embed disruptive historical narratives into the process of making itself, as the river becomes the site of convergence. These geographical and metaphorical bodies of water that have been distorted, disappeared and ‘ruined’ (both by a history of dictatorship cover ups and photographic memory) are able to reappear as latent and liminal image-objects in an open ended encounter with multiple narratives of the river. Part of the auratic translations of images from the 1930s on the river in Argentina, these photographic renditions (large scale) emphasize the troughs and fissures that occur when different surfaces and iterations occur. The research is centred on a photo album found of my grandfather’s images of the turn of the century in Latin America and create a dialogue across time. There is a photograph that I discovered some years ago, a photograph in ruins, that can be read only in the ‘traces of what is no longer present.’ I will call this photograph ‘Hats on the Paraná’, as it has triggered an investigation into the network of dialogues that address narratives of place in contemporary printmaking and photographic practice. This photograph, taken circa 1930, along the River Paraná in Argentina (according to a caption on the back) is a snapshot found in a forgotten family album and belonged to my grandfather, Henry Richard Ahrens. I never knew my grandfather, as he died when I was only two years old. All that remains of him in my mind’s eye is a vague recollection of a tall man in a hat, at the margins of my vision, as well as a handful of stories of him handed down by my family. Certainly, I had no idea that he was a keen photographer and, as so many of his time, collected his photographs in the pages of a now worn and weathered photographic album. The image itself (figure 2) is an analogue, silver based print and captures a faded shot of the river, trees running up both sides in a triangular composition, sky mirroring the water and a bird flying out of the image. On closer inspection, in the bottom right hand corner of the photograph, cut off by the edge of the print are two gentlemen in what appears to be a rowing boat (the end of an oar cuts the photographic plane): they are both wearing a hat, each one is different and distinct – one belonging to the man whose face we see, is a captain’s white naval hat with a visor, the other, firmly positioned on the head of a man whose face is turned and obscured, is a fedora. Both men in their hats inhabit the print at its margins, as incomplete figures, torso-less, limbless, and now, lifeless and still. They represent the only human presence visible in the image; two strangers whose existence remains partially engrained on the surface of a print, yet unknown to me. The surface of the print is beginning to deteriorate, creating superficial distortions on the left side, and across the bottom of the image. These are chemical erasures that are reacting to time and atmospheric conditions, eating at the print and peeling away at its coating. Where the river fades into a vanishing point in the centre of the photograph and the trees that frame it on both sides collide with the sky, the faintest shadow of a white sun hangs low on the horizon. The man wearing the captain’s hat is positioned, it would seem, in the centre of the boat, mouth poised open mid speech, while the second man sits behind him, looking away from the photographer, only his right ear and the dark socket of his right eye below his hat are visible. A tear in the right hand corner of the print creates a line culminating in a void, which runs through the captain’s eyes, scratching them from visibility, and impeding our view and, in a sense, the captain’s ability to see ‘us’. He is blinded by the sun, as he squints at the photographic lens, and twice blinded by the fragile scratches. The print is in ruin, compromised by time and alchemy, and its meaning is being lost with it. The photograph is fading, yellowing and tearing, as its transient history marks its passage through time: it is of the past, but seen in the present and disappearing into its future.